Time for Motherhood and I to take a road trip (never thought I’d see “motherhood’ and “I” in a sentence) I very carefully bundled her up like a mummy :} and gently propped her up in Bella and off we went to Maple Ridge to visit Auntie Kerry. She arrived in one piece (Yay!) 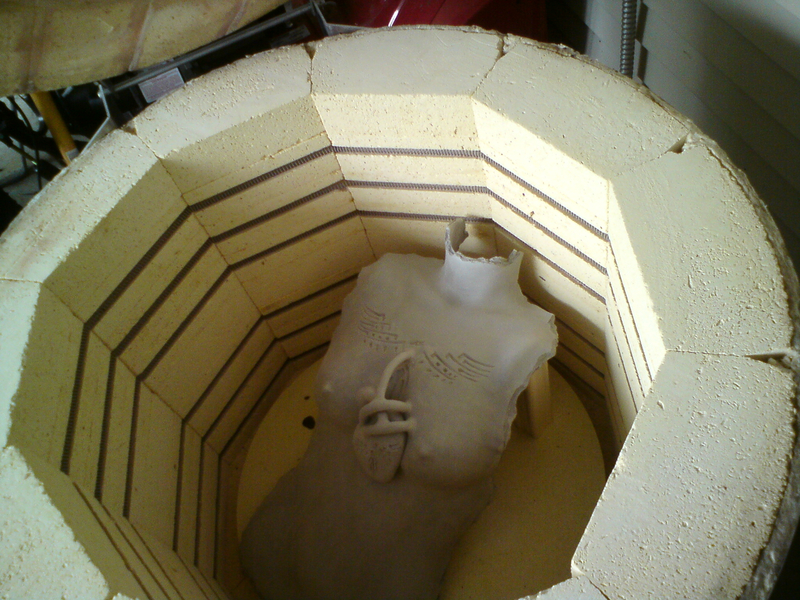 and into the kiln she (torso, not Kerry) went for the first of at least 2 firings. This one is the easy one, the glaze firing is where I will need the blessings of the kiln Goddess and any other deity that is listening in. In the kiln, ready to go! Then, of course, we had to start in on glaze choices, the first of many I’m sure. What fun! Glaze chips flying around the kitchen, back and forth on what feeling am I aiming for. Colour is so freaking important but not just colour but textures and tones as well. Also there is the absence of colour that creates its own voice. So what does her voice have to say? I find myself several times a day poking around that question, she is never very far away. The basic question comes down to light or dark, one invokes vulnerability and the other nurturing/safe. Of course both are applicable but which is the one I want to focus on with this piece? I think I may have just answered my question! Yippee! Well the dilemma today was form vs concept. Do I go with something that looks good as opposed to manifesting an idea? Since my work is mostly concept driven it is a tightrope that I often find myself on. The challenge is to find away to honour both and not get lazy and just cave to one side. Balance in all things. Yah Buddha! Well Ms.Thang is done and I’m not comfortable calling her Torso 8 (especially since she is torso 7, apparently counting is not my strong suit)… so her name, at least thus far, is Motherhood. I am chanting the potter’s matra “it is only mud until it comes out of the glaze kiln whole it is only mud until it comes out of the glaze kiln whole it is only mud until it comes out of the glaze kiln whole”. Buddha again, attachment = grief (my paraphrasing). sigh. But I’ve already named her… so please pray with me to what ever deity sings to you and hope my girl comes through the upcoming trials whole. So I was thinking that it might be fun to actually write some posts about what creative endeavours I am up to and kind of keep a record of my processes. We’ll see how it goes. 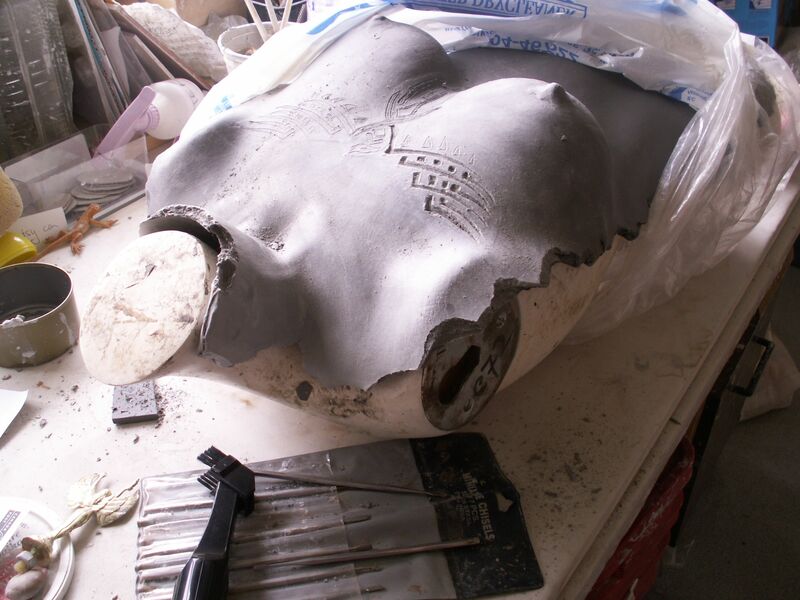 After a long drought with the Torso Series I am in the middle of doing a new one. I actually thought that I had run out of concepts. Then I wondered if I had actually run out of physical space for them which triggered a drying up of my torso juices. Which actually led to a year of not touching clay at all. Any one who knows me will not be surprised at the amount of analysis and angsting I put my poor brain through. That’s the way I roll and am learning not to give myself a hard time about it.. but then I start to analyze that… whatever. It was born from a quote I heard about being a mother that has haunted me for years, sitting in my brain fermenting till a few weeks ago it was made physical in the form of a torso. I often create like that and always get such a rush from it when it happens. Of course I can’t tell you the quote otherwise it will give it away, maybe. It could also be so obscure that only I get it, not like that hasn’t happened before. But here is a pic of where I am now. The carving of the Phoenix is the most time consuming and trickiest of the whole thing, especially with paper clay. The paper in it makes it hard to carve, tends to be flaky. But I like using it since it is soooo flexible and forgiving, allowing me to really push the boundaries of what clay can do. Compromises, always compromises.